Vote for Us! and ERGObaby Calendar Contest! We’re always proud to offer the best products and service to you and your little ones. Now it’s your turn to show how proud you are of us! Vote for Junior Towne as the best children’s store in the 2009 Anchorage Daily News Best of Alaska awards. Vote online at www.adn./bestofalaska/ or look for print ballots in Play and the Saturday and Sunday editions of the Anchorage Daily News. Voting deadlines for online ballots are Sunday, August 2, for print ballots, Friday, July 31. Tell all your friends, family and neighbors to get out and vote for Junior Towne as the best children’s clothing store. Thank you for your support! We value our loyal friends and customers. How do you use your ERGObaby Carrier? ERGObaby wants your pictures! ERGObaby is hosting a 2010 Calendar Contest. Throughout the month of July, send them up to three pictures of your baby in the ERGObaby Carrier-they will choose the best one and post it on their Facebook page. On August 7th, they’ll announce the 13 winners-each winner receives a HandsFree System and gets to star in their calendar! To enter, become a fan of ERGObaby on Facebook. Then send your pictures to them at reviews@ergobaby.com. They’ll post your pictures and the winners will be announced on August 7th! Thanks for being a Junior Towne fan! Oops! We forgot to tell you-Celeste is unpacking our fall Stride Rite shoes and Sorel boots today. She is having lots of fun in the shoe department. Are you signed up for our shoe club? Someday, they’ll walk in your footsteps! But first, they must walk on their own. The people at Junior Towne know what it takes for the best fit in a pair of shoes. We have measured and sized thousands of little feet from the first pair right on up through school sneakers. And no one knows the careful and caring science of children’s footwear better than Stride Rite. Stride Rite shoes bend at the right place and offer the proper support in others. For some reason, little Alaskan feet seem to be wider than average which is why we specialize in wide and extra wide widths. A child’s feet are with him or her the rest of his life-good shoes and a proper fit are so important. Our fall selection of Stride Rite footwear is arriving daily. 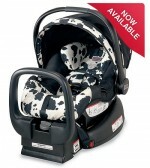 Britax Infant Chaperone Car Seats now in stock! We recently partnered with the non-profit Soles 4 Soles organization which provides recycled shoes to people around the word in dire need. You brought in a huge number of children’s shoes which we sent to Nashville, TN for cleaning and distribution. The mission of Sole 4 Souls is “Changing the World One Pair at a Time.” Thank you to all our loyal contributors-the drive was great success. One another note, did you know that we also give your outgrown, gently used shoes when you leave them with us to several worthy, local organizations such as Clare House, the Salvation Army and North Star School? We do this throughout the year but summer and back to school time in Alaska seems to be critical. New shoes are always best for children’s feet but when money is tight and your child’s feet have grown, a gently used pair is very much appreciated. Next time you are in, please drop off any extra children’s shoes that you might have. We will see that they go to a good home! You are currently browsing the Junior Towne Blog weblog archives for July, 2009.